In the last year, data breaches in the retail and healthcare industries have reached unprecedented heights, affecting millions of customers through major hacks such as Anthem, Target and Home Depot. But colleges and universities are also at a high risk for data breaches because of the sheer amount of student and alumni data they process. And according to Symantec’s 2016 Internet Security Threat Report, education accounted for 6.6% of all reported cybersecurity incidents in 2015, tying with business as the second-most-breached subsector. For hackers, college campuses are a wealth of opportunity. Thousands of students, parents, faculty and staff input personal and payment information into university systems every day. Despite the high volume of private information, many universities do not have an appointed position for a Director of Information Security, leaving their information vulnerable for hackers. 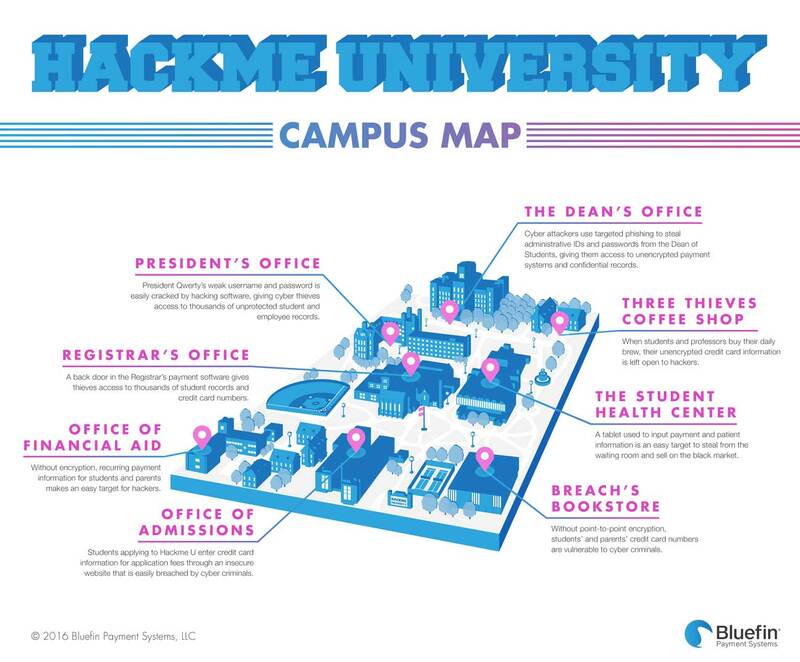 The map below shows just a few ways that hackers can gain access to information databases on the average, unprotected college/university campus.